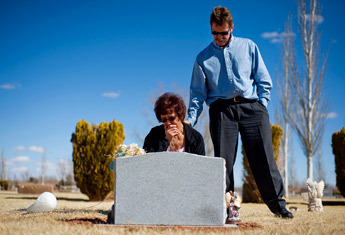 WINSLOW, Ariz. — Before his death in October 2007 — at age 39 — Winslow resident Marc Rogers was never able to publicly speak out about an incident that forever haunted his life, an incident in which a Diocese of Gallup priest was arrested and accused of molesting him when Rogers was a 14-year-old boy in 1983. Rogers’ family now believes that several powerful authorities in Winslow — the Winslow Police Department, the Navajo County Attorney’s office, and church officials with the Diocese of Gallup — acted in ways to silence the voice of Marc Rogers by shutting him out of all legal proceedings against the Rev. John Boland. Family members say after Boland was transferred out of Winslow and the case was closed, Rogers emotionally shut down and descended into a troubled life of alcohol and drug abuse. They believe those addictions, combined with the diabetes he had struggled with since adolescence, led to his early death. The family is now trying to be Marc Rogers’ voice in this world. And ironically, their opportunity to speak out was triggered by the actions of Phoenix Bishop Thomas J. Olmsted, the current apostolic administrator for the Gallup Diocese. Olmsted recently pulled Boland from ministry, pending an investigation, after reportedly finding a reference to the alleged molestation charge in Boland’s personnel file. At the time of the alleged incident, Feb. 26, 1983, the city of Winslow and Navajo County were steeped in allegations of public corruption. The Winslow Police Department was being investigated by Arizona authorities in an investigation that ultimately sent Police Chief Walter Maule and several of his officers to prison. In addition, Navajo County Attorney Jay Flake was being prosecuted in federal court for income tax fraud, and an earlier trial involving extortion and conspiracy charges against Flake had ended in a hung jury. Helen Bardsley had her own share of personal worries at the time. A member of Winslow’s Hispanic community, Bardsley was struggling through her second devastating divorce while trying to support her two teenage sons, Adam and Marc. At first she hadn’t been too concerned to learn that Marc and some of his best friends were spending a lot of time with the priest across the tracks at the Madre de Dios parish, the Rev. John Boland. “I felt you could trust a priest more than anybody,” she said in a lengthy and emotional interview in her home on Wednesday. Helen Bardsley — now Helen Wagner — said she was raised in a devout Catholic family, attended Catholic school in Winslow, and used to attend Mass every Sunday. However, her older son, Adam, knew different stories about Boland. If you were a teenage boy and wanted to drive cars, drink alcohol, and smoke marijuana, he explained during the interview, you hung out with Boland. Those stories became all-too-real to Wagner one night when Marc came home “extremely drunk” after spending the evening with Boland. The next morning, Marc suffered his first seizure, causing his frantic mother to call an ambulance. Rogers’ alarming friendship with Boland continued, Wagner said. Once Rogers and his friends showed up with an IV bottle filled with vodka that they said Boland had given them, another time they had a “beer bong” helmet, and another time Rogers showed up with a $100 bill that he said Boland had given him. Wagner said that on Feb. 26, 1983, Rogers disappeared for what he said was going to be an evening of watching movies with Boland. The priest brought her intoxicated 14-year-old son home late that night, and Rogers went straight to his room where he passed out. The next morning, Wagner said, Rogers’ friends showed up at her house with a disturbing story. The boys claimed Boland had kicked all of them out of his church residence except for Rogers. They also claimed they remained outside the house and kept knocking on the door and the window, but Boland wouldn’t let them in. The boys made an allegation of sexual molestation against Boland based on what they said they saw through his window. Wagner said she took one of the boys into Rogers’ bedroom where they woke him up and the boy shared his story once more. Wagner said Rogers allowed her to examine his legs, which she said had scratch marks along his inner thighs. Now distraught, Wagner said she called Child Protective Services, which sent two women staff members to her house. Wagner said they interviewed her, Rogers, and his friends, and they also viewed the scratches on Rogers’ thighs. The CPS workers then notified the Winslow Police, Wagner said, but no police officers ever came to her home to interview them. Police never interviewed them ever, she added, neither did anyone from the Navajo County Attorney’s office. According to court records obtained from Navajo County Superior Court, Boland was soon arrested and charged with four class 1 misdemeanor counts of contributing to the delinquency of a minor and one class 3 felony count for committing a lewd and lascivious act upon a child under 15 years of age. A document from Winslow Justice Court shows Boland was released to the custody of Gallup Bishop Jerome J. Hastrich. Wagner said as soon as Boland was released from jail, he showed up at her house and angrily asked her, “Why are you doing this to me?” Wagner said she and Boland argued at the front door, with the priest denying he did anything to Rogers and asking to talk to him, and Wagner repeatedly ordering him to leave. Eventually he did leave, she said, but he continued to call her home asking for her son. Wagner said she and Rogers were only called to one court hearing regarding the case against Boland. Superior Court records indicate she and Rogers received subpoenas to appear at a court hearing on June 6, 1983. While they waited in the hallway of the old Navajo County Courthouse, she recalled, two former school friends angrily approached her. “How could you do this to him?” Wagner recalls one of them asking her. “He’s a good priest. He would never do anything like this.” Stunned by the remark, Wagner said she told the woman she would think differently if it happened to her own son. Wagner said she and Rogers never testified in the hearing and were never allowed inside the courtroom. Wagner recalls an unknown man — an attorney she thinks — coming up to tell her that she could leave because the case was dismissed and Boland was being transferred out of Winslow. “What? Oh, my God,” Wagner recalls saying out loud. Wagner said she and her son walked to the car where they sat and held hands and cried. “This was the beginning of my son’s demise,” said Wagner, who describes her son’s life after the incident — a life marred by alcoholism, drug use, a broken marriage, and three suicide attempts — as “a slow death” that was worse than cancer. This week, nearly 26 years after Boland was arrested, Wagner’s other son, Adam, read for the first time the court documents involving his younger brother. To his surprise, Adam Rogers learned that the court hearing his mother and brother had been sent away from was not the last court hearing for the Rev. John Boland. More court hearings were scheduled and held — concerning the two charges involving Marc Rogers — but the Rogers family would never know about them until February 2009.